Cattle being watered at the Ghibe River in southwestern Ethiopia (photo credit: ILRI/Stevie Mann). 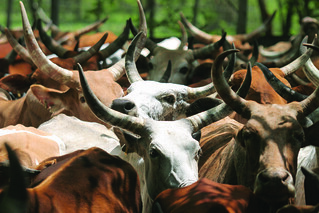 The successful eradication of rinderpest in 2011 offers vital lessons that can be applied in the ongoing quest to eradicate other deadly animal diseases. In an opinion piece in SciDev.Net (16 Aug 2017), Delia Grace, co-leader of the Animal and Human Health program at the International Livestock Research Institute, shares her experiences as part of the global rinderpest eradication campaign.